Will consider trades for Express or Open Fisherman with diesel power. 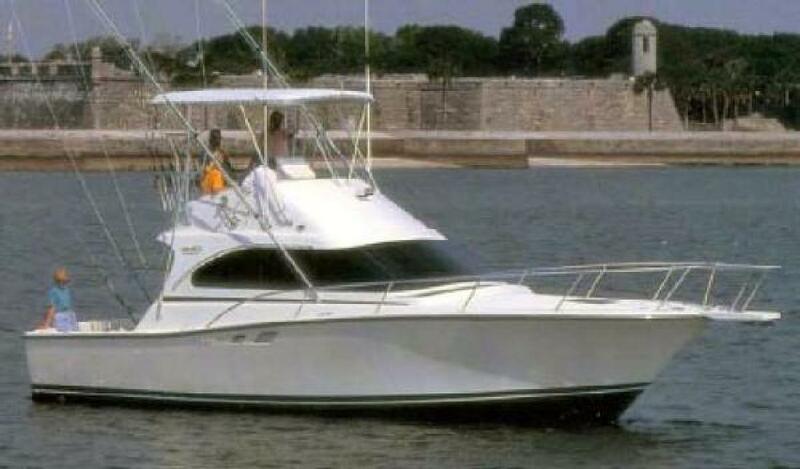 (LOCATION: Jacksonville FL) This Luhrs 350 Convertible is an affordable sport fisherman with flybridge, and large cockpit. The Luhrs 350 is a proven design with generous flare at bow, wide beam, is fully equipped with everything you expect in a sport fisherman. This well-maintained Luhrs has the size to be practical, large enough to travel well and small enough to maneuver. She features a spacious cockpit with room to fish. Overhead is a roomy bridge deck with bimini top, centerline helm, and dual Todd helm chairs and forward guest seating. Helm is equipped with Furuno radar, Garmin 500 GPS chartplotter, Simrad autopilot, and Standard Horizon VHF radio. She features outriggers, rocket launchers, spreader and spot lights, fighting chair, prep station, livewell, rod holders, transom door, swim platform, underwater lights, cockpit washdown, and in-deck fish boxes. The open salon is made for cruising with room to relax or dine. There is a large L-shaped sofa to port and sofa to starboard. The forward entertainment center has TV, and sound system. To starboard and down is the galley with white cabinets with teak trim, solid surface counter with stainless steel sink. Appliances include two-burner cooktop, microwave oven, and under-counter refrigerator with freezer. The forward stateroom has queen berth, lots of storage, flat screen TV, and overhead hatch. An enclosed head has vanity and shower stall. There's ample room for overnight and weekend getaways. Powered by twin GM 454 engines this convertible has the power to cruise comfortably and dependably. If you are looking for a smooth running, well-built, sport fisherman with comfortable accommodations this is a boat you must see. Call now to schedule a showing of this Luhrs 350.